NEW YORK STATE SITEPOWER provides design and installations services from start to finish with our own skilled employees - no subcontractors. You benefit from a single point of contact throughout your project. Most of our staff consists of expereinced electricians who are cross-specialized as generator technicians. In addition, leverage the experience and knowledge of our in house PE and our NABCEP certified solar engineer. We have the necessary tools & experience to evaluate your site, catalog your electrical loads, specify the proper backup power system, execute the entre installation and perform startup comissioning and live testing. 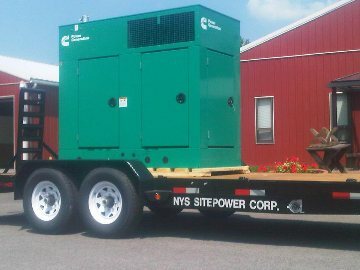 After you're up and running, NEW YORK STATE SITEPOWER provides ongoing service contracts and warranty support for years to come. There is no other company in upstate New York that handles all of this under one roof. Best Service, Best Value, Best Choice - NEW YORK STATE SITEPOWER.